Among the many exciting things to in Rotorua is to climb aboard a seaplane, take off from the lake and fly for a scenic tour of the Mt Tarawera volcano. Volcanic Flight offers a range of flight times, routes and aircraft and its itinerary includes the volcano trips as well as helicopter journeys to the active volcano of White Island. 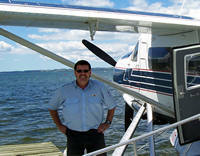 The 35-minute trip I took was in an Otter seaplane - which is an experience in itself. The 10-seater was built as a North American workhorse but is spacious and comfortable, headsets keep the pilot in touch with you as he explains the natural features and the various coloured lakes below. They also are necessary to drown out the noise of the powerful engine! Take-off is great fun - I really love those off water although you do need to be aware of where your lifejackets are ... just in case - and the sweep back over the lake and city are excellent viewing. There are a few bumps as you head over the hills around Rotorua and below you are the series of famous lakes around the city. It has to be said Mt Tarawera was an amazing sight, with massive sections of it pushed from the mountain by the 1886 eruption that destroyed The Buried Village. The colours are amazing - including a myriad of shades of red - and the sheer size of the explosion, which left an eight-kilometre crater, will have you a little awestruck at the power of a volcano. Other sights from out of your window include the Blue and Green Lakes, Whakarewarewa, Waimangu's three-coloured lakes, sulphur bay and White Island. 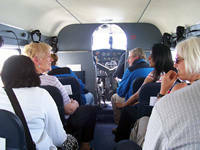 There is a huge range of flights to suit both itinerary and budget, and the staff and pilots are really friendly. A trip on Volcanis Air is well worth the time. Over Lake Rotorua, Sulphur Bay, the geysers of Whakarewarewa Thermal Reserve and Rotorua City. The airline's most popular tours! Mt Tarawera erupted in 1886 creating an 8km long volcanic rift along its summit the magnitude of which is only fully appreciated when viewed from above. Landing and Tour From the Rotorua City Lakefront over the Crater Lakes District to the summit of Mt Tarawera to view from above the awesome volcanic rift of this icon attraction. Continue north over Lake Okataina to an exclusive landing and 30 minute guided tour at Hell’s Gate – Rotorua’s most active geothermal area. Return across Lake Rotorua. Allow one hour. Located 50 km off the Bay of Plenty coast. Experience the fury of nature at work on this awesome Island of the Pacific “Ring of Fire”. 1. 4(a) Floatplane White Island and Mt.Tarawera Over Hell’s Gate Thermal Valley and the Northern Lakes to the Pacific Ocean coastline. Circle and view from above the crater and fearsome activity of White Island active volcano. Return over Mt Tarawera’s volcanic crater rift, the Steaming Cliffs, Waimangu Volcanic Valley, the Blue and Green Lakes, and the geysers of Whakarewarewa Thermal Valley. Flight time 1 hour 20 minutes. 4(c) Helicopter White Island and Mt Tarawera As per tour 4b but with the added attraction of flying over Mt Tarawera. (Allow 3 hours 15 minutes). Over the Crater Lakes District and the volcanic rift of Mt Tarawera. Continue south via Waimangu and Waiotapu Thermal Areas to land at the Hidden Valley of Orakei Korako. Transfer by boat across the lake to explore the bubbling hot springs, gushing geysers and natural beauty of this hidden geothermal wonderland. 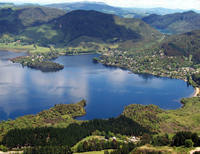 Rejoin your aircraft for the return trip to Rotorua. (Allow 2 hours 15 minutes).